Last month, AEE filed a petition for declaratory order with the Federal Energy Regulatory Commission (FERC) raising alarm over suggestions that ISO New England (ISO-NE) might implement significant changes to the measurement and verification of energy efficiency resources in the region’s Forward Capacity Market (FCM) without following appropriate procedures. The petition, filed jointly with Sustainable FERC Project, seeks an order from FERC that would protect market participant investments in existing energy efficiency resources from retroactive changes made solely at ISO-NE’s discretion, and ensure that any future changes would occur only through established procedures, including review and approval by stakeholders and ultimate FERC approval. The AEE petition came after ISO-NE staff made a series of phone calls to market participants who held energy efficiency resources qualified to participate in the upcoming Forward Capacity Auction (FCA 13). In those calls – which occurred just days before FCA 13 was scheduled to be held – ISO-NE staff stated that the grid operator was considering changing longstanding practices in how it measures the value of energy efficiency resources for purposes of the FCM. In these calls it was also suggested that the changes might be applied retroactively and without FERC approval, even though the contemplated changes could significantly impact energy efficiency resources that had already qualified for FCA 13. Not surprisingly, these calls created market uncertainty for energy efficiency resource providers, as well as substantial concern that ISO-NE would implement such changes without conducting required stakeholder discussions or filing the changes for approval with FERC. The nature of the measurement and verification changes suggested in the phone calls also raise serious concerns about the future capacity value of energy efficiency resource investments, and potentially other demand-side resources (including demand response and distributed energy resources). Energy efficiency resources have always been defined and valued based on their total reduction to energy consumption from baseline federal standards. In technical terms, efficiency projects are evaluated based on their adjusted gross reduction to load. In its place, ISO-NE suggests it might require a “net-to-gross” conversion of energy efficiency resources in order to count only net energy efficiency savings that might not have occurred otherwise. In other words, ISO-NE would require energy efficiency resource providers to conduct a counterfactual examination of the extent to which energy efficiency gains are directly attributable to capacity market participation, rather than measuring their total contribution to the region’s capacity needs. These new conversion factors have never previously required of market participants, nor have they ever been defined or described in ISO-NE manuals or other guidance documents. They could also significantly reduce the amount of energy efficiency resources qualified in auctions. Our petition, which launched a FERC docket, argued that ISO-NE’s contemplated actions, and the unusual step of calling market participants just days before the auction to announce them, caused significant harm to the market in a number of ways. First, because energy efficiency providers could no longer rely on the ISO-NE Tariff and approved Measurement and Verification Documents, they were forced to be conservative in bidding their resources into FCA 13, and would likely be forced to be conservative in bidding future resources as well. The exclusion of these highly cost-effective resources from ISO-NE’s Forward Capacity Markets would also drive down supply, increasing overall capacity prices for consumers. Moreover, reducing the value of energy efficiency resources from their actual verified reductions in demand from a baseline would result in the procurement of unneeded capacity from more expensive generating resources. In addition, the uncertainty creates turmoil for state-funded energy efficiency providers by complicating their ability to make accurate filings with state commissions and other relevant authorities. That in order to change the requirements for energy efficiency resources going forward, including imposing any requirement to convert from adjusted gross to net, an RTO/ISO must follow the appropriate process for changing its tariff, including submitting the proposed change to the Commission for approval pursuant to Section 205 of the Federal Power Act. A diverse set of 13 parties – including utilities, energy efficiency providers, states, and consumer advocates – have filed comments at FERC supporting AEE and Sustainable FERC Project’s requests. In an answer to the Petition, ISO-NE did not dispute that it was contemplating the changes to the measurement and verification standards described in the petition and acknowledged that it is obligated to “conduct a stakeholder process” before making such changes. ISO-NE did not, however, commit to filing those changes with FERC. ISO-NE also asserted that the petition should be dismissed because it has not actually made the contemplated changes. AEE plans to file a response to ISO-NE, making it clear that FERC action is required to alleviate the uncertainty caused by the potential changes signaled in this unconventional manner. We, along with Sustainable FERC Project, brought this issue to FERC’s attention to provide greater market certainty to energy efficiency resource providers in New England, including AEE members and partners, in the near term. 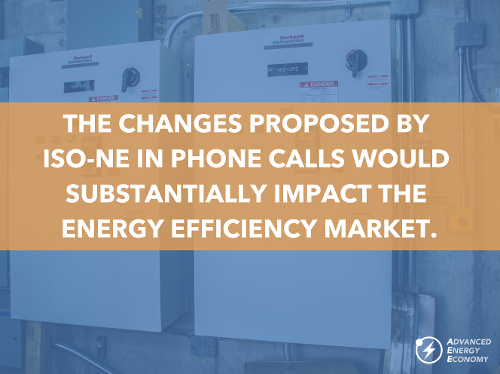 The measurement and verification changes proposed by ISO-NE in phone calls would substantially impact the energy efficiency market in New England, reducing the value of energy efficiency resources in the FCM, driving up prices, and ultimately forcing customers to pay higher electric bills. In addition, embedding the concept of “net-to-gross” conversion of the value of demand-side resources in ISO-NE’s tariff and practices without FERC review could post a significant risk to the market value of other advanced energy investments (including demand response and clean distributed generation technologies) as well. Moreover, the petition follows other developments in the ISO-NE market that have stoked concerns about the continued ability of advanced energy technologies to participate on a level playing field, and to the ability to meet the New England states’ aggressive clean energy goals. For example, significant capacity from a newly approved offshore wind project was excluded from participation in FCA 13 (though it is noteworthy that ISO-NE would have allowed Vineyard Wind to participate, but a majority of FERC commissioners would not approve a waiver of ISO-NE’s rules in that case). In addition, to address “fuel security” concerns, FERC and ISO-NE have approved the continued operation of the existing Mystic Generating Station under an out-of-market cost-based rate that include not only the full cost of the generating plant, but also the costs of associated LNG infrastructure to supply that plant. These developments diminish market access opportunities for new advanced energy technologies and provide an unfair preference (through guaranteed cost-recovery) to aging and increasingly uneconomic facilities. To foster robust, reliable, and competitive wholesale energy markets that provide a platform for advanced energy innovation, we need strong, consistent, transparent, and predictable market rules that work for all technologies. AEE and our members and partners hope to work cooperatively to address these issues with ISO-NE in the stakeholder process moving forward. Sierra Salser is an AEE communications intern from Austin College, TX, completing American University’s Spring Internship program in Washington, D.C.